“Anything but a misery-fest”: Julia Rank reviews Show Boat at the start of its new West End run. Show Boat at the New London Theatre. Photo: Johan Persson. 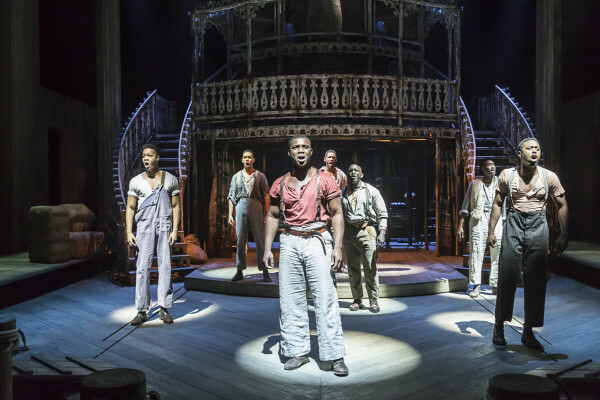 Whilst listening to a 1950s recording of Jerome Kern and Oscar Hammerstein II’s Show Boat on my way to the New London Theatre, I was somewhat taken aback by the chirpiness of the chorus singing about, ‘Colored folks work on the Mississippi… gettin’ no rest till the judgement day’. There’s no such artificial jollity in the depiction of race relations in Daniel Evans’s production, which nimbly brings this grand old lady of Broadway into the 21st century West End with the respect due to a beloved matriarch, as well as a modern sensibility without pushing a hyper politically correct agenda (anyone remember Gone with the Wind at this same venue with its enlightened Prissy?). It can be difficult to appreciate just how radical Kern and Hammerstein were in eschewing fanciful operetta conventions to pioneer a new kind of musical that aimed to entertain and also shed light on the modern world. The ‘one big happy family’ that is Captain Andy Hawks’s floating theatrical palace the Cotton Blossoms gather together on stage, but the underlying tensions amongst blacks and whites gradually rise to the surface, resulting in a face-off of palpable bitterness. When Joe, the every-riverman sings that he’s ‘tired of living but scared of dying’ (a poignantly youthful Emmanuel Kojo, rather than a stalwart veteran), the idea that such a young man should be so worn down is all the more devastating. Lest that sound too gloomy, Show Boat is anything but a misery-fest. It’s so full of life in its depiction of show boat life, a delectable, long-lost bit of Americana. These gaudy, gorgeous vessels (splendindly evoked by Lez Brotherston’s three-tiered dollhouse of a set) brought musical and melodramatic theatrical magic to the masses in Midwestern and Southern backwaters during the ninenteenth century. Edna Ferber’s 1926 novel is a fantastic read, very feminist and surprisingly concise in spite of its wide-reaching scope. Kern and Hammerstein’s musical, on the other hand, has always been a sprawling affair with multiple versions for a director to choose from. With a revised book by Rob Ruggiero, it retains its sprawl whilst gaining a more streamlined quality. To a large extent, it’s best to indulge this show by letting it have its layer cake and eating it. The central romance, in which giddy sixteen-year-old Magnolia Hawks falls hard for handsome gambler Gaylord Ravenal, wouldn’t be out of place in an operetta, and the backstage goings on staples of vaudeville. What makes it different is the way in which the marriage plot doesn’t end with the wedding and shows the highs and lows of life with such a man. The score features two of the most beautiful love songs written for the Broadway stage in ‘Make Believe’ and ‘You Are Love’ but they are contextualised within a kind of realism: real emotions with real consequences. The way in which the cast embody Ferber’s strong women with plenty of moxie (fun fact: in the novel, ‘Ol’ Man River’ is very much a female presence) is a pleasure. As lovestruck heroine Magnolia, the radiant Gina Beck offers a soaring operatic soprano rarely heard in the West End these days, as well as a flair for goofiness and physical comedy. Rebecca Trehearn plays a luscious Julie La Verne, whose rendition of ‘Bill’ is delivered through a haze of alcoholic bitterness combined with a diva’s longing for one last success. In spite of all the lush declarations of romantic love that permeate throughout the show, I feel that its most moving and mutually unconditional love story is in fact the one between these two friends (what a shame that romantic love is the only one that’s sung about!). Sandra Martin also offers a fabulous voice and stage presence as ship’s cook Queenie, a character that could be a two-dimensional ‘Mammy’ figure but is in fact the true keeper of the music adopted by the white folks, not to mention the mistress of the skirt-swishin’ dance moves that lead that glorious knees-up ‘Can’t Help Lovin’ ‘dat Man’ (joyous work by Alistair David). All the nice girls like a gambler: indeed, this is the third classic musical featuring a professional gambler currently playing in the West End, along with Guys and Dolls and Funny Girl (there’s something about the alpha male confidence that these gentlemen exude). Chris Peluso has the puppy eyes and laid-back gallantry of a perfect Southern gentleman, his mellow tenor blending as if ‘in a phantom kiss’ with Beck’s soprano. His mother-in-law and nemesis Parthenia Ann Hawks, the puritanical terror of the Mississippi (my favourite character in the novel) is played with superb sourness by Lucy Briers, locked for better, for worse in an odd-couple marriage with Malcolm Sinclair’s ageless Captain Andy (I could have done without the lame henpecked husband/domineering wife jokes – so dated). Show Boat is not a perfectly constructed piece, which is particulalry apparent in the reprise-heavy second act, during which the action hurtles forward some twenty years, culminating in a grey-wigged reunion (a bit like Follies but hokier). In Ferber’s novel, Magnolia and Ravenal never see each other again after he abandons her and their daughter Kim, whilst both film versions offer a happy ending. Spoiler alert: What we get here is a bittersweet compromise in which Magnolia and Ravenal meet again at the end but don’t get back together. Magnolia ends up where she started, albeit in flapper dress rather than calico; she’s ‘got to love one man till she dies’ but also gets on with her life after that rainy day when he goes away for good – reconciling being a hopeless romantic with also being a feminist? Tell me I’m crazy for such overanalysis, maybe I know. Showboat is on until January 2017. Click here for more information. Julia is a Londoner who recently completed a MA in Victorian Studies at Birkbeck College. Resolutely living in the past until further notice, Julia finds enjoyment in exploring art galleries and museums, dabbling in foreign languages, rummaging in second hand bookshops, and cats.